The charity concert was organized with the help of international organization and performed by non-professional singers-song writers. The songs were in Russian, with an excellent translation into English. My foreign friends enjoyed a wonderful acoustic guitar. Though there were people of different nationalities two universal languages – music and English were featured that evening. Also, there was one aim and subject to discuss before and after the concert – it is human trafficking in Kazakhstan and all over the world. Being aware of this evil is essential for anyone. So, recently my own younger sister was at a risk. She was waiting for the bus when a suspicious looking middle-aged man came up to her, offering to give a lift to her job. Was he someone working next to her office or was she watched after by this man? However, my kid sister is knowledgeable enough about any danger and she is a very sensible girl. Trafficking, kidnapping is happening here, just look around you. Made by survivors report that, every minute traffickers traps another child into slavery. One more story from my backyard. A girl was living with her mother in some industrial city near the capital, when a mother got married. The woman left her 16 year-old daughter with grandmother and moved to another place. Consequently, the teenager got terribly angry and became uncontrollable. She started to date a young man and went to the capital city with him. It turned out that the man was drug addicted, he sold the girl to a brothel, where she stayed for 5 years. She tried to escape but was taken back, she underwent a terrifying pressure and through it all she has survived. In the shelter for victims of human trafficking the girl was taken care of, the psychologist and social worker conducted trainings and therapy to help her to recover. She is fine and even started her own business, selling some goods. Also, she is a volunteer at the shelter which helps other victims. This story was told by the rep of some non-governmental organization. I`m invited to go to another shelter next month to see the way they work. As you see, the happy ending and new life is possible after slavery but unfortunately not for everyone. The head of this other shelter won all the trials on traffickers. I must talk to this person! How I DO love the comments that I get from my reading audience, those who take the time to read what I write the past four years. However, I often like to feature what other thinkers on Kazakhstan’s problems write. The following poem is a follow-up by a reader to a poem I posted in January of this year. I had found a fragment of a poem titled “Little by Little.” The reader did some searching and came up with the rest of the poem and the possible source for it. For that I’m grateful. I realize too that the battle we face with human trafficking will take incremental, baby steps in order to make people realize that slavery is a tragedy reaching epidemic proportions in our world. We must NEVER give up combatting this evil, we MUST persevere. By their slew but constant motion. But just endeavor, day by day. Will prove to be a plain. The same sweet sermon preaches. A little more looking, and it seems the London Band of Hope, or UK Band of Hope, etc., was/is a temperance society formed in 1847. Might that have meant something to your family? Anyway, the poem seems to have made its way into several children’s primers, such as the Heath Reader and the Beacon Reader. Thanks for pushing me along my journey….. The following piece was recently written by a Kazakh linguist who has since moved to America. She has a certain perspective on Kazakh culture and politics that only a person who loves her own country can have. I’m also grateful that she corrected my spelling of Pakazooka (see my last post) since I always wondered what the spelling really was for this Russian term. I had only heard about it from my husband who speaks Russian and he muttered it plenty while we lived in Ukraine for seven years and Kazakhstan for three and a half years. It’s “показуха” or in standard Soviet transliteration, “Pokazukha” (“poh-kah-zoo-kah” phonetically). From the Russian verb “показывать” (to show) + noun-forming “-ух” suffix which in this case denotes a negative attitude towards the term. Yes, like you said, a show off, a pretense, a dog and pony show. There’s a colloquial equivalent with a stronger critical connotation often used by the youth, “понт(-ы)”, or “Pont(-y)”. In Kazakh we would say “maqtan” or “ozing-ozi maqtan” in the same sense. Yes, I left Kazakhstan because I simply couldn’t be physically present in my home country that I love so dearly, so much was the daily suffocation from the political environment and injustice, so many things I didn’t agree with. I started being a bit involved in the politics, I just couldn’t help it, but I strongly resented the idea. Too dirty games. Potentially very dangerous for my loved ones, too, couldn’t afford it……. About Nazarbayev, unfortunately, he is just a son of his people… My mom’s friend, a composer, singer, “aitysker” (traditional Kazakh dombyra-debater), studied with Nazarbayev at the same school for 10 years (or maybe 8, not sure). So I personally know what the roots of our country’s leader are. Besides, I simply have eyes to see. I know well what his personal qualities and ambitions, especially after working as a translator for a few months at a Japanese company and having to translate during meetings with very high-ranking Kazakhstan officials. He is no leader for a country, he is far from that caliber. He should have been a director of a steelworks plant as the maximum. But, unfortunately, in the communist party of the USSR the only qualities from the leaders in the Central Asian Republics that were valued were of total submissiveness to the centre in Moscow, lack of moral principles to sack your opponents and a strong stamina to keep your subjects in fear and submission. A perfect recipe for a dictator, isn’t it? I did not travel as much as I would have liked in this very large country of Kazakhstan, especially to see the western part where the supposed “oil money” is. Yet I saw enough just outside of Almaty and Astana to know there are still many schools and libraries that are woefully far, far behind any western developed nation. Pakazooka really means “just for show and without substance underneath.” No different than a Potemkin village set up in Ukraine that was supposedly to satisfy the powers that be while the Ukrainian people were really languishing in poverty. Over eighteen years the United States Peace Corps has fruitfully worked with Kazakhstan in accordance with the Agreement between the Governments of the United States and Kazakhstan regarding the activities of the Peace Corps in the Republic of Kazakhstan signed in 1992. During these past years, more than 1,000 Peace Corps volunteers have undertaken great and useful work highly regarded by the Kazakhstan side. On November 18, Peace Corps informed of the suspension of their activities in our country providing a number of comments in this regard. The relevant release says the decision was made “based on a number of operational considerations” and cites the fact that Kazakhstan is one of the most developed countries in the world where Peace Corps has run its programmes. Due to the fact that Kazakhstan has achieved great progress in the political and socio-economic development over the 20 years of its independence and today is a country with an income above average, we believe that the suspension of the activities of the Peace Corps in Kazakhstan is a rather logical step. As it is known, this organization assists mainly the least developed countries. In addition, many programmes of the Peace Corps in Kazakhstan, in general, have come to their conclusion. We proceed from the understanding that this decision is connected with an internal review of priorities, the adjustment to the organizational plans and the redistribution of volunteers to other parts of the world. As it is known, the spectrum of activities of this organization includes more than 70 countries. We can state with confidence that US volunteers and our countrymen alike who benefited from the invaluable experience of communication and mutual cultural enrichment with this organization will remember all these years of effective partnership with warmth and gratitude. Hope you are doing well and I could see and talk to you face to face again and try your chocolate chip cookies! Anyway life is like a roller-coaster. Though I have some personal troubles with my work yet the [trafficking] shelter fulfill the gaps and make it meaningful. When I first started to work with Anara, the head of the shelter in Astana, there were three women rescued from the slavery. Three different women had different backgrounds, same trouble. Finally here’s a continuation of the story. The first, Natasha is 21 years old. Her mother is alcohol addicted woman with a slight mental disability used to bring men home, drink and then let them sleep with her teenage daughter. Natasha is mentally slow, and could be abused easily. Her mother once sold her for a few bottles of vodka. These men kept and forced into prostitution for about 8 months then let her go or may be just thrown away. Natasha was trapped by other people in Astana and was rescued by chance. To the flat, where Natasha was kept the owner brought another girl. This new girl quarreled with mother and ran away to the city where she was kidnapped at the railway station. Ending up at the same flat with Natasha, the new girl broke the window and asked for help. The neighbors heard the cries and called the police. The new girl went back home and Natasha was taken to the shelter. Natasha was supposed to go to the college of vocational training and continue her education. Before the start of learning she asked people to send her home to her mother. Natasha did not come back; her disease and being genetically addicted to alcohol became much stronger than all the treatment at the shelter. Next is Vera. She is 27, has a boy of 11 years. The baby was at the orphanage because of her alcohol addiction. On this reason she became a slave and was forced into prostitution. I don`t how Vera got to the shelter, but she was there more than half a year. Anara helped her take a son from orphanage and sent to the manicure courses, then found a job in the village near the shelter. However, Vera started drinking again. Now she is in the clinic for alcohol and drug addicted people for 4 months and her son Vlad lives in the shelter and goes to the local school. Mary promised to give some clothes for the boy. And the last is Asema. She is 25, used to be a prostitute and then forced to work for the owner. At the shelter she got the cure and went to the manicure courses. Now she works at the beauty salon near the office of the fund and I see her from time to time. She always smiles to me and looks pretty good. Anara and all the shelter workers hope she will do well and start a new life. These three women used to attend English classes in summer when I started my work. That is the background of my work with the trafficking shelter and the public fund. I`ll write you more about activities we did together with the British teacher volunteers, if it is interesting for you teacher. Now I need to have lunch and go to teach business people to earn some money! Thankfully I’m hearing from at least three of my informants in Kazakhstan about the incremental progress we are making to help combat this tragedy of slavery. So many sad stories I read off the Internet about what people do to other people who are powerless. Not only women and children, but men as well, are trafficked into Kazakhstan from other countries. Below you will read an update I received about 11 Uzbek men who escaped cruel and inhumane punishment with the ongoing building construction that continues unabated in Astana. The following was added as a thank you, written by a Kazakh national for the expats’ efforts to collect clothes for these men. “On behalf of me and my colleagues involved in the shelter work here in Kazakhstan, I want to express our greatest gratitude for your continuous support. The victims of human trafficking are often brought/rescued with no personal items and we are often in desperate need for clothes, shoes, hygienic items, towers, bed clothes etc. Therefore, your donations are very important for us since no other organization or grant can cover the costs of this items, not to mention the difficulties of purchasing new. We want to assure you that every piece of men or female clothes you donate reaches the hands of those in need. A pair of shoes, or a warm sweater means so much for these people accustomed to be treated badly and inhumanely. Once again, and all your colleagues involved in this important and generous initiative, THANK YOU! 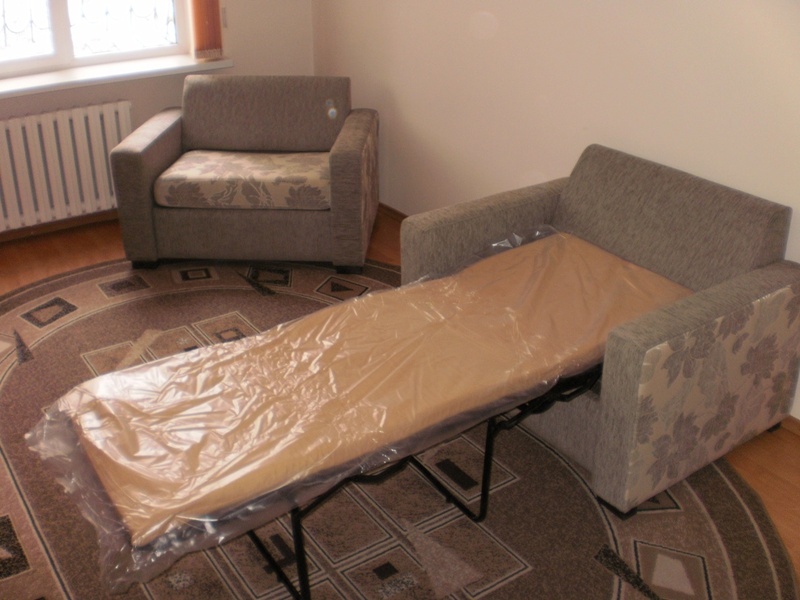 The photos below are the actual chairs which turn into beds that escaped trafficked women can use in a small two room flat that functions as a shelter. Tomorrow I will continue with more correspondence about this shelter in Almaty that my American lady friends helped buy the chairs/beds with their work at a rummage sale several months ago. It is gratifying to know that though we couldn’t outright send the leftover clothes that we didn’t sell to Kazakhstan because it is cost prohibitive, we donated to another charity. 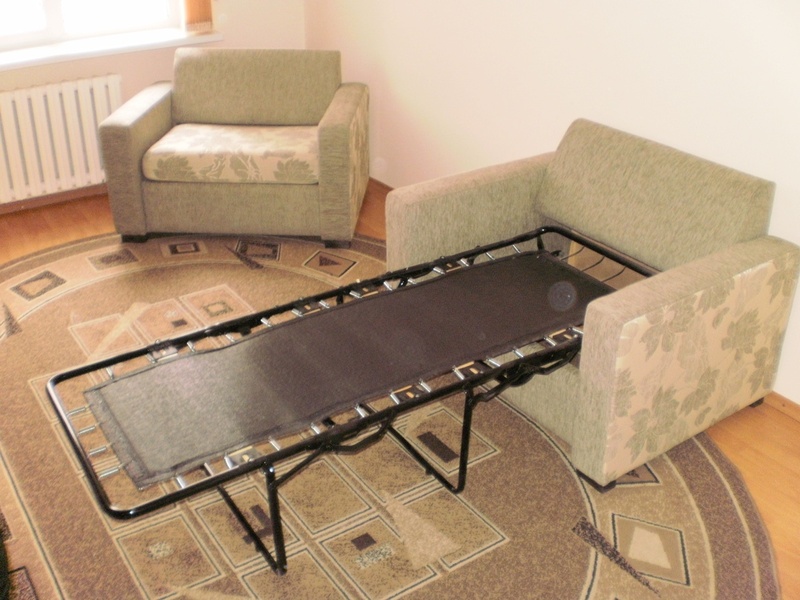 The money we DID make was turned into necessary tangible items the trafficking shelters need in Kazakhstan.